Oakland’s Ryan Coogler established himself with his first feature, Fruitvale Station. He had several other projects already in the works including a script for his own take on Sylvester Stallone’s Rocky — many years later. Coogler needed to convince the actor to let him resurrect the character Stallone had created but in a new context— no longer as a fighter but a now a mentor. The results are a wonderful surprise with an entertainment everyone should enjoy. Though film critics have not mentioned it in their rave reviews, the film is full of genuine humor largely delivered to perfection by the veteran actor and there is a particularly exhilarating scene when Adonis is running down the Philadelphia streets in training. But that is all we are going to tell you. 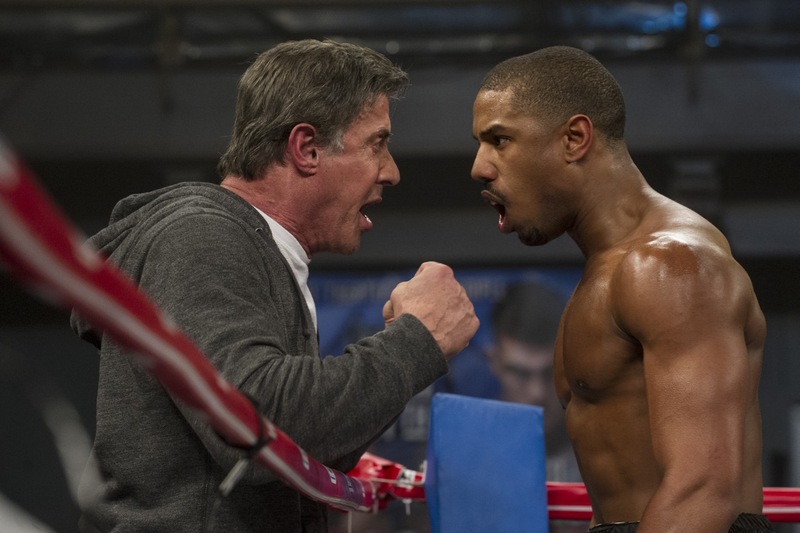 Creed is not just a reboot of a franchise. It is a re-ignition, as director Ryan Coogler has made a film every bit as thrilling as Rocky, the 1976 Best Picture Oscar winner that started it all. The Oakland native moves smoothly from the small-scale intensity of his feature debut Fruitvale Station to the pressure-cooker arena of Hollywood filmmaking without missing a step. He has made one of the best films of the year and he is well on his way to a monster career. Sylvester Stallone reprises his role as Rocky Balboa as he hands off the reins of the franchise that he created, knowing that it couldn’t be in better hands. Since 2008, studios have been increasingly reluctant to spend money on movies with anything slightly resembling an original idea. Not they they were terribly brave before the market crash, but in the years since they managed to pull their cards even closer to their chests. Even so, clever filmmakers — as they have always done — have found ways to express creativity within the system. One of these ways is to inject new life into long-running franchises. This year, George Miller did miraculous things with Mad Max: Fury Road. In 2013, Shane Black somehow snuck subversive themes about the emptiness of action movies into his Iron Man 3. 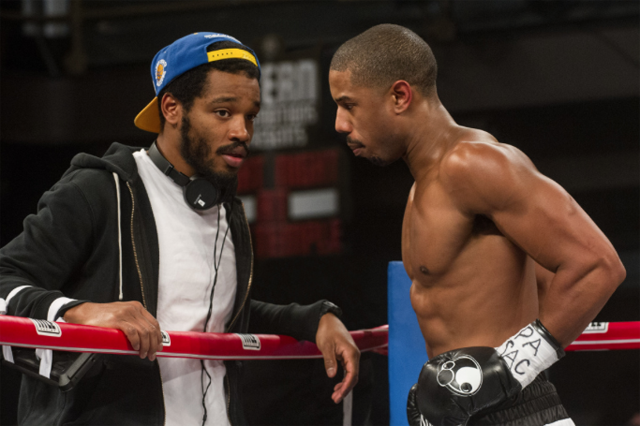 Co-written by Coogler with Aaron Covington, Creed is based on a story of Coogler’s. His love and deep knowledge of the Rocky universe is evident in both his storytelling and his approach to the material. 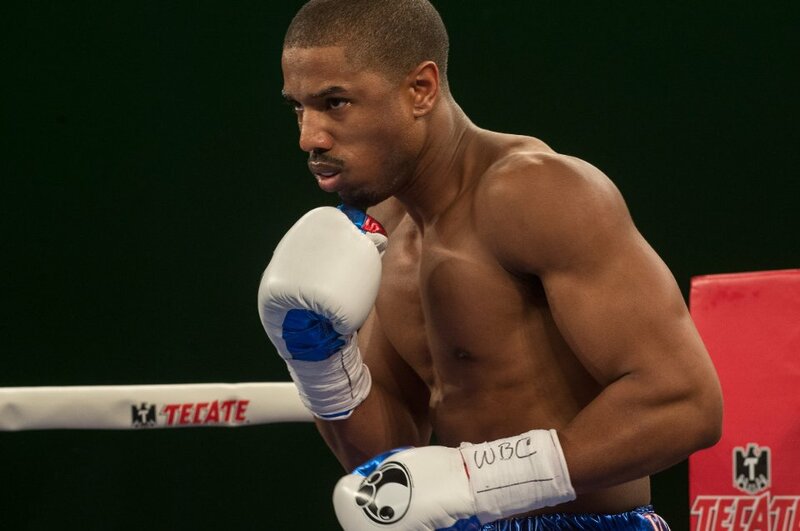 The focus here is on Adonis Johnson (Coogler’s Fruitvale Station star Michael B. Jordan), the son of Rocky’s competitor and best friend Apollo Creed. Born after Soviet boxer Ivan Drago killed his father in the ring, Adonis has grown up with a legacy hanging over him but without ever having a chance to know the man who left it to him. Success in unsanctioned fights in Mexico leads him to believe that he has what it takes to be a champion, even if it isn’t evident to anyone else. No one knows that he’s his father’s son and he’d like to keep it that way, but when he decides to get serious, it is in his father’s direction that he travels. He moves Philadelphia where he hopes to be trained by the long retired Rocky Balboa. 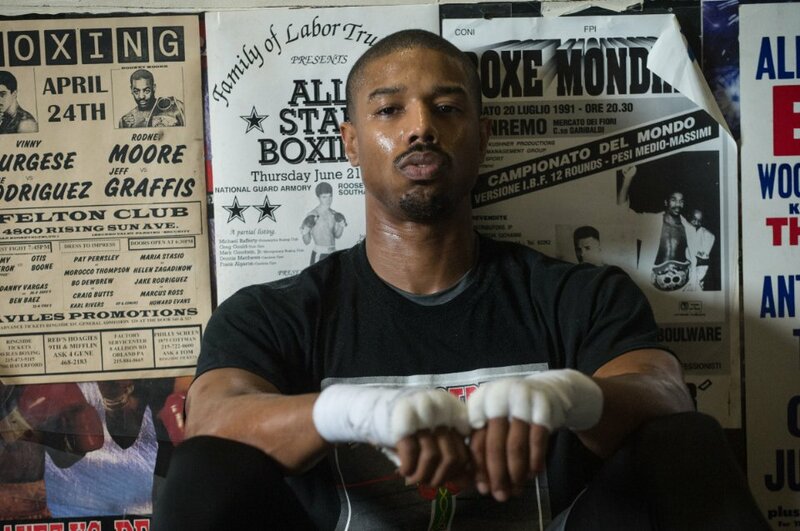 Coogler doesn’t try to reinvent the wheel, as the arc of Adonis from underdog to contender is ripped right from the Rocky playbook, but even though that rise is familiar, it’s no less suspenseful. The film’s technical aspects are impeccable, in particular, Maryse Alberti’s cinematography that puts the viewer right in the center of the action during Creed’s fight scenes, Claudia Castello and Michael P. Shawver’s editing that adds so much to scenes of rising tension, and Ludwig Göransson’s exhilarating score. But what ultimately sells the film is its characters and the relationship that forms between the fatherless Adonis and Rocky, long estranged from his own son. There are plenty of punches thrown in visceral bone-rattling, blood-spattering fights, but Creed is not merely a boxing film or a sports film. This is a drama about fathers and sons, the fatherless son embracing a paternal figure and the older man, who, in many ways, has been going through the motions in what he views as the twilight of his life, gaining not just a surrogate son but a new sense of purpose. 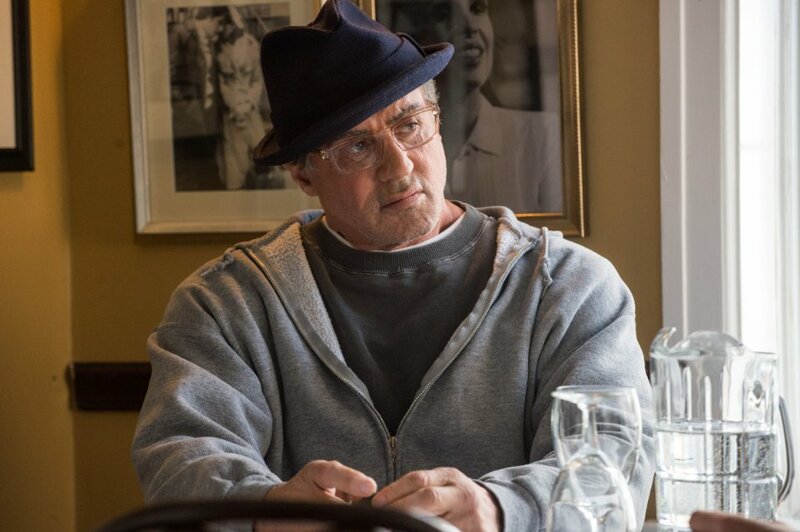 Stallone essentially takes over the avuncular role that Burgess Meredith played in Rocky and three of its sequels, the seasoned vet transforming the unlikely into the most likely to succeed, but with more layers of emotion. Jordan is fantastic, but the revelation is Stallone, who delivers his best performance in years. With his beloved Adrian and so many friends gone and slowed by the infirmities of age (on top of the punishment his body took over all those years of boxing), Rocky cuts a poignant figure. Yet, he is not so far gone that he can’t rise to the possibility of triumph when Adonis enters his life. It’s been nearly 40 years since Rocky Balboa’s first championship bout, and he hasn’t forgotten the electric charge of being in the ring. 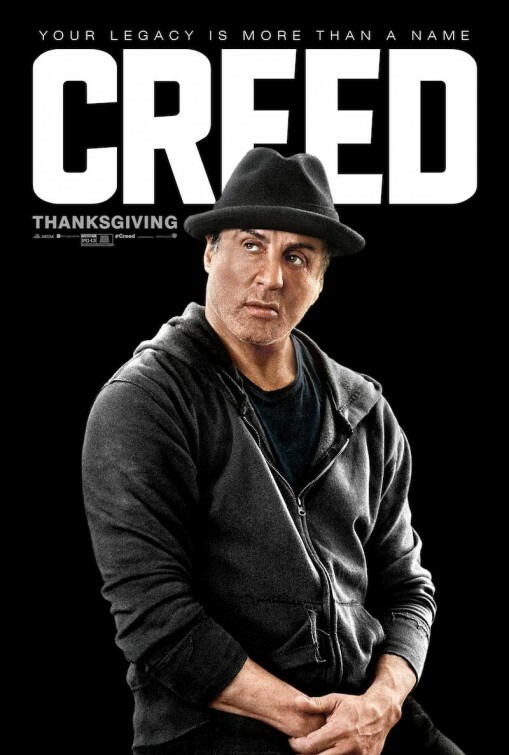 Stallone is 69 now and embraces it in Creed, and that willingness to be the old man is one very big key to reinvigorating the franchise. 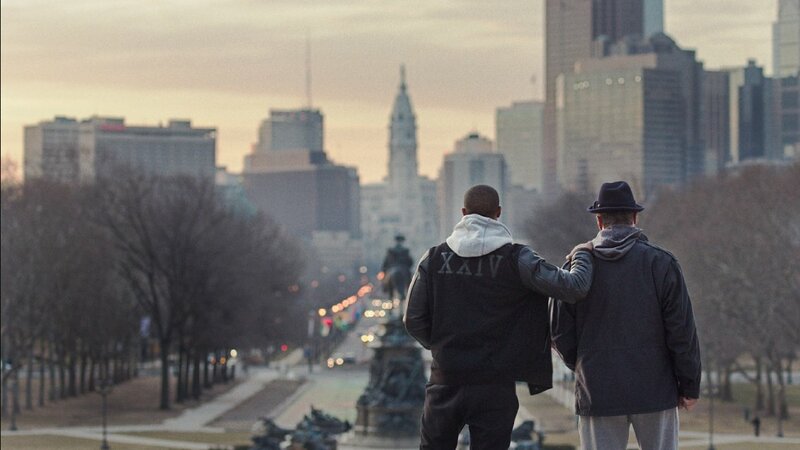 From a trip to the Philadelphia Museum of Art steps that Rocky ran with joy so many decades ago to a sampling of Bill Conti’s unforgettable “Gonna Fly Now” music, Creed pays homage to its forebears. At the same time, it stands on its own, a glorious piece of cinematic storytelling. Plans for two sequels have already been announced, marking this as the start of a new franchise. That seems like a safe bet. In turning to films that he loved growing up as inspiration for this own film, Ryan Coogler has exceeded expectations. Long live Rocky Balboa. Long live Adonis Creed. Since 2008, studios have been increasingly reluctant to spend money on movies with anything slightly resembling an original idea. Not that they they were terribly brave before the market crash, but in the years since they managed to pull their cards even closer to their chests. Even so, clever filmmakers — as they have always done — have found ways to express creativity within the system. One of these ways is to inject new life into long-running franchises. This year, George Miller did miraculous things with Mad Max: Fury Road. In 2013, Shane Black somehow snuck subversive themes about the emptiness of action movies into his Iron Man 3. And Sam Mendes gave James Bond an exquisite new artistry and depth in Skyfall (2012). Now the Oakland-born filmmaker Ryan Coogler has worked more miracles with the 40 year-old Rocky series. Director Ryan Coogler and Michael B. Jordan. Coogler, you may remember, gave us a compassionate and thought-provoking Fruitvale Station (2013), which earned strong reviews, but was totally ignored at Oscar time (despite handling by those Oscar-machines, the Weinsteins). For voters, it was probably too simple, and yet not simple enough. It offered no moral lessons, no rational explanations, for what happened to Oscar Grant (Michael B. Jordan). It simply made the tragedy clearer by showing us who he might have been, his problems, his goodness. It may have seemed like a step back for Coogler to abandon ambitious projects about life and take on a movie-movie like a Rocky film, but he does something extraordinary with his seventh Rocky. He gives it life. 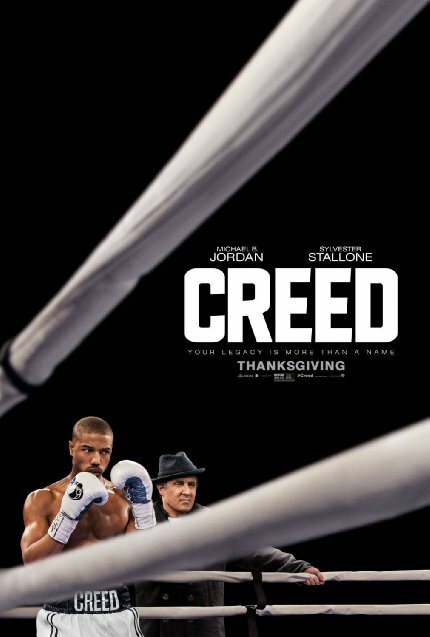 Creed begins with a flashback set in echoing stone hallways, with official, stern-looking grown-ups ordering young boys around. A boy (played by Alex Henderson) fights with some other boys, and he has a particular ferocity coming from somewhere deep within. 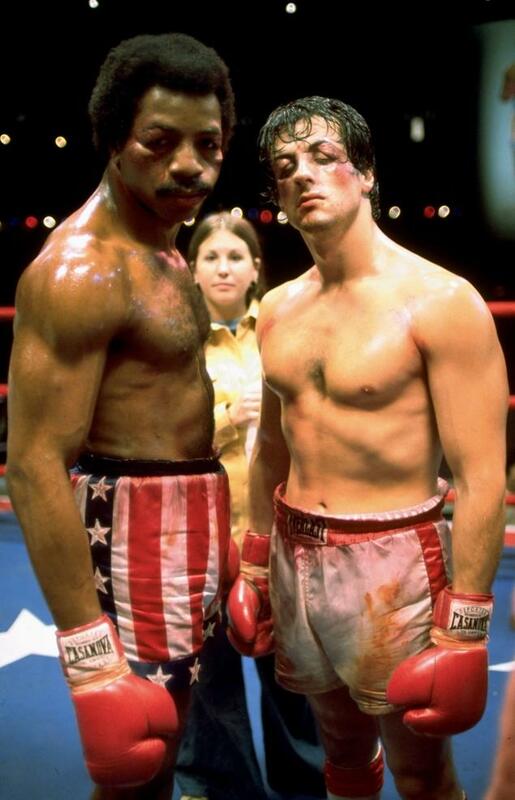 A woman, Mary Ann (Phylicia Rashad) comes to see him; she is the widow of Apollo Creed (played by Carl Weathers in the first four Rocky films, and killed in the ring by Ivan Drago in Rocky IV). The boy is Adonis, or “Donny,” the illegitimate son of Apollo. 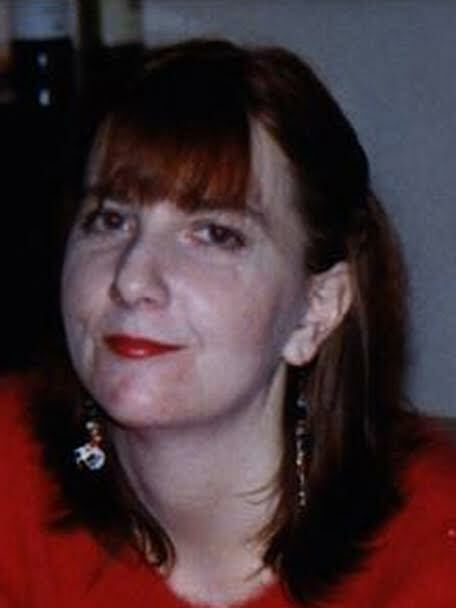 Mary Ann offers to take him in and raise him after a lifetime of foster homes and institutions. Years later, Coogler gives us some striking juxtapositions. Jordan takes on the role of the grown-up Donny, a light heavyweight. He prepares for a fight in a ratty Tijuana ring. The fight is shown from slightly below and off-center, shot through the ropes. It’s over quickly, and Creed wins. He still has this powerful, pureblood aggression. What has happened to him over the years? In an astonishing cut, we next see Donny at work, in some kind of financial firm, sitting at a desk, tapping on a computer, and wearing a tie, his knuckles faintly bruised. When he comes home, it’s to the spacious, hard, white mansion bought by his father’s heavyweight champion money. In just a few scenes, Coogler sets up what is going to be a fascinating character study. Let’s reiterate that Creed is a character study, much like the original Rocky (1976), rather than a superhero movie or a comic book movie like some of the middle Rocky sequels became. The movie never betrays this setup. Donny takes the next logical step; he decides he can’t work in an office while something burns inside of him, and, over the protesting of his adopted mom, he goes to Philadelphia to find the legend, Rocky Balboa (Sylvester Stallone), to ask for his training expertise. In their first scene together, Coogler demonstrates once again what he’s up to here; he’s dismantling anything larger-than-life, or mythical, or legendary. He’s getting back to life. Remember that secret fight between Rocky and Apollo in Rocky III, whose outcome was left up to your imagination? Creed tells us what happened. While training, Donny meets a beautiful singer, Bianca (Tessa Thompson), but even this relationship is far from typical. 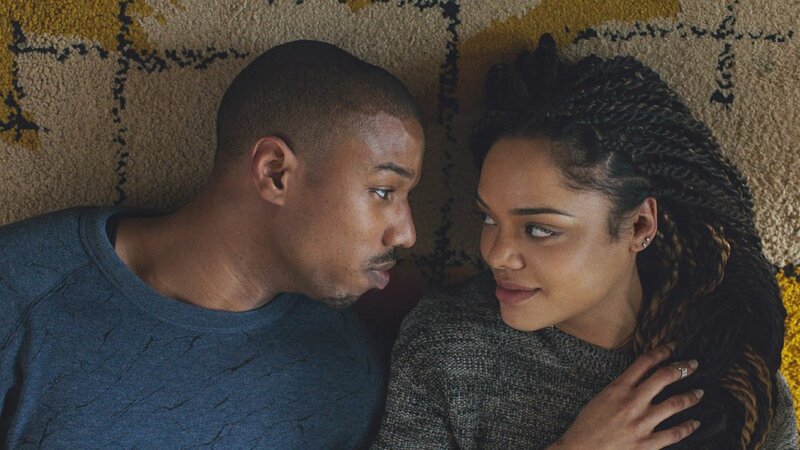 Yes, their conversations, and the way they progress together as a couple is richly written and emotionally realistic, but Coogler throws in a fascinating thematic wrinkle. Bianca has progressive hearing loss, something that would be difficult for anyone, but is especially tragic for someone whose entire life is music. Everyone in this world of Creed has only this moment, with only the tools available to them at present. The future, and any possible happy endings, are things of imagination and fiction. Even Rocky finally faces his mortality in this movie; death surrounds him. He even keeps a folding chair hidden in a tree for when he goes to visit his family in the cemetery. Throughout the movie, Coogler keeps topping himself. There’s the shot of Donny boxing along with a big-screened YouTube clip of his father and Rocky, fighting with them, but also against them. There’s Donny’s second fight, shot in what appears to be an absolutely revolutionary continuous take. 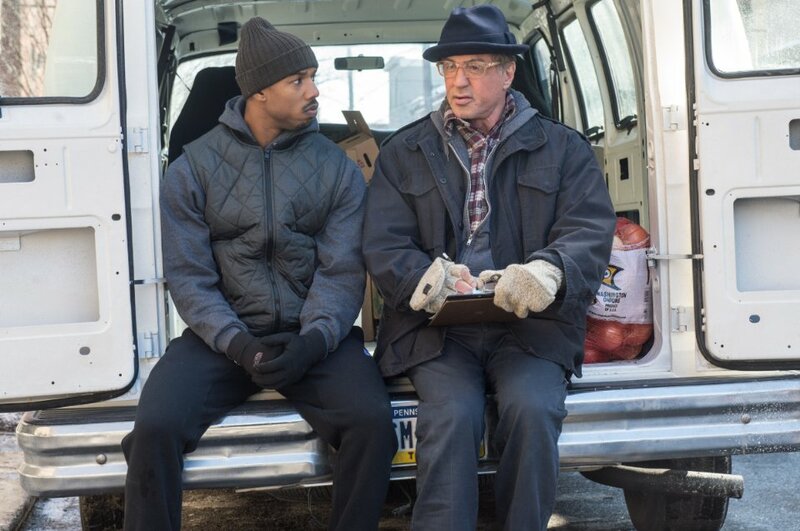 There’s the complex debate over whether to use the name “Creed,” and what it means. There’s the final fight, better seen than described, but sure to enter the lexicon of great cinematic fights. And there’s the follow-up to Rocky’s victorious run up the Philadelphia Museum of Art steps. 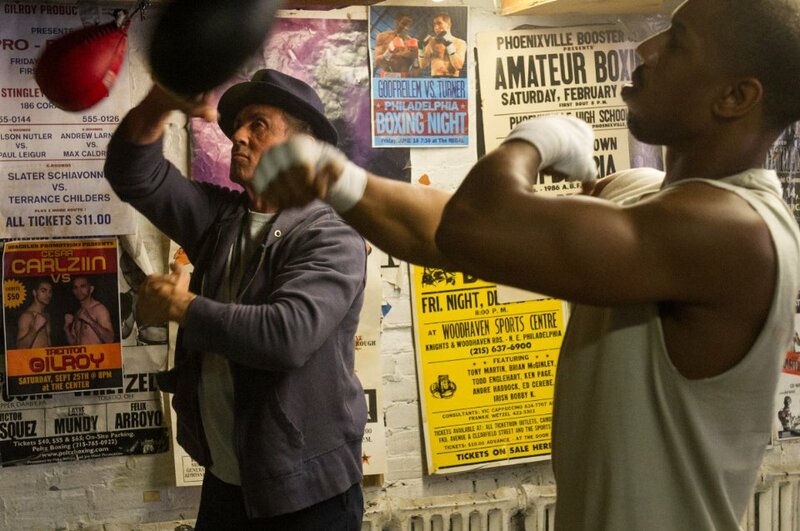 In-between Coogler, who co-wrote the screenplay with Aaron Covington, keeps proposing brilliantly simple themes, such as Rocky and Donny approaching a full-length mirror; Rocky tells Donny to face his fiercest opponent, to shadow box with him. “I’ll leave you two alone for a while,” he says, as only Rocky could say it. As a footnote, though Creed is a totally, thoroughly satisfying movie on every level, it must be said that Stallone is particularly magnificent here, and that’s because he carries with him a huge history. His own Rocky was a small movie that became a legend; it was almost a Cinderella story. It’s whispered that he wrote the screenplay in just a few days, with no money in the bank, and then negotiated to get the lead part, talking MGM out of casting whoever was on the “A” list at the time. He gained financially and in star power, but he lost his two Oscar nominations, and his career locked onto a particular path. Like his screen character Stallone became a kind of superhero, appearing in dozens of big, dumb action movies, some of which are well-made and entertaining, but very few of which realized his actual appeal. 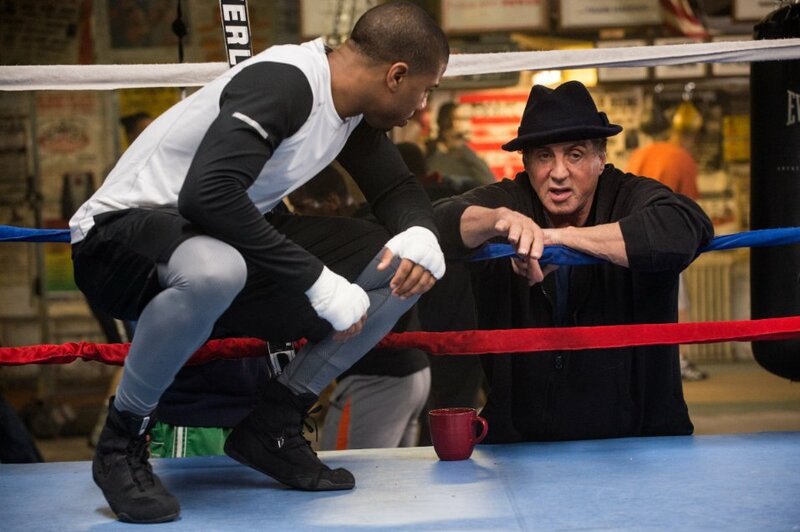 Creed is an almost magical full-circle for him, and one that could earn him that long-awaited Oscar. 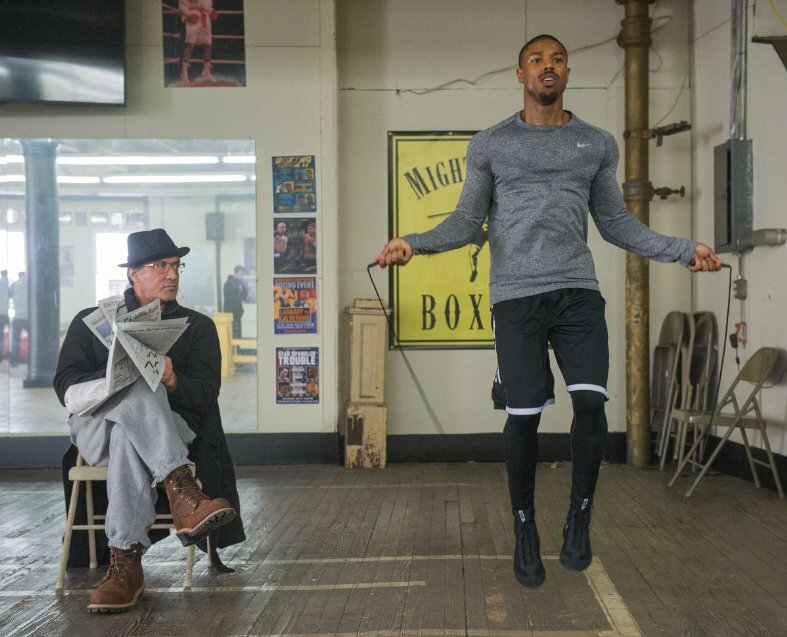 Not that Oscars are all that important in judging the worth of a new movie; Creed is inexorably connected to an Oscar-winner, yet it moves ahead with its own body and soul. Jeffrey M. Anderson has written about movies professionally since 1997. 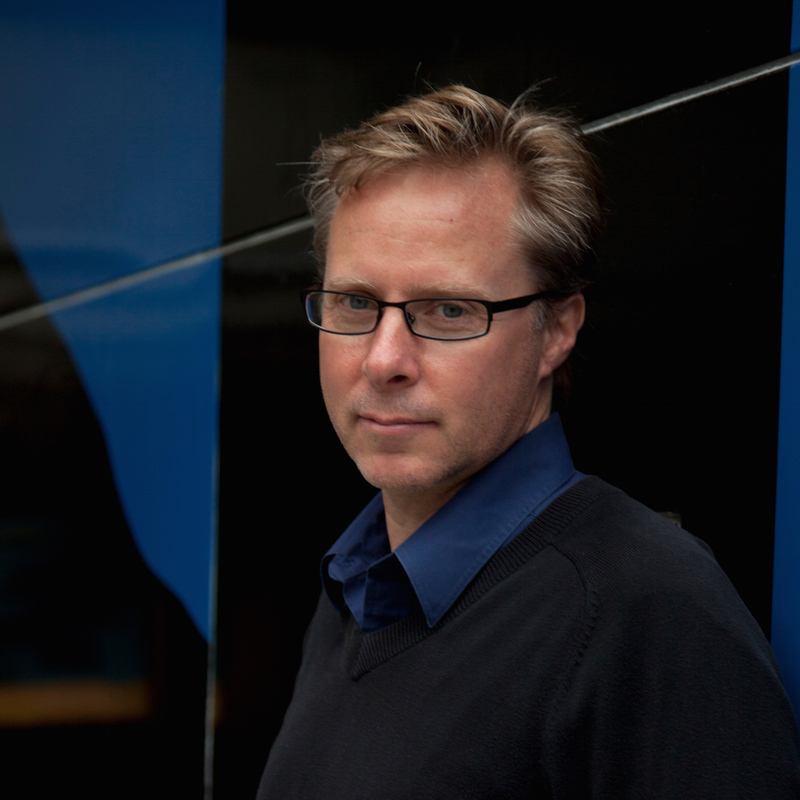 He writes regularly for the San Francisco Examiner and Common Sense Media. His work as a freelance film critic has appeared in The Oakland Tribune, The Metro (Silicon Valley’s Weekly Newspaper), the San Francisco Bay Guardian, the Las Vegas Weekly, FlickNation.net, MacWorld’s online blog TechHive.com, Cinematical.com, Movies.com, Greencine.com, and BayInsider.com. In addition, he maintains his own movie review website, CombustibleCelluloid.com. He holds a master’s degree in cinema, is the co-creator of a movie-matching site and has appeared as an expert on film festival panels, television, and radio. He is also a founding member of the San Francisco Film Critics Circle. He even worked in a video store. Creed director Ryan Coogler’s directorial debut Fruitvale Station. The 6-disk Rocky Heavyweight Collection containing Rocky I-V and Rocky Balboa. Hear Bill Conti’s inspiring Rocky soundtrack. This entry was posted in Columnists, Films, Films: Critics Corner and tagged Apollo Creed, Creed, Fruitvale Station, Jeffrey M. Anderson, Pam Brady, Rocky, Ryan Coogler, Sylvester Stallone. Bookmark the permalink.